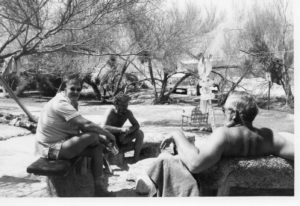 Two days after the Spring Equinox in 1980 I drove up to the Lower Warm Springs in Saline Valley for my first time. 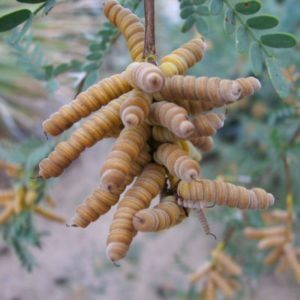 The discovery of the lower warm springs was quite by accident (https://timenspace.net/2018/02/11/saline-valley-chronicles-recollections-of-days-gone-by/). Little did I realize at the time how profoundly this unintended discovery would change my life in the years to come. I had been travelling through the southwest in my 1960 VW microbus visiting hot springs on my way to a new life in Colorado. 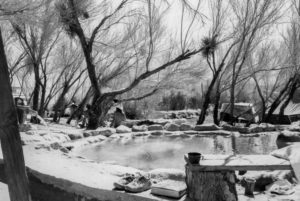 While I had the advantage of using a published hot spring guide, no mention had been made of the Saline Valley Warm Springs. At that time, everyone wanted to keep it a secret for as long as possible. The Lower Warm Springs camp was quite a bit different back in the day than it is in present time. Palm Springs has not changed quite as much, beyond the new palm trees there. I would like to tax my memory and share some recollections of the way things used to be, and along the way, how they came to be by the time I found them. 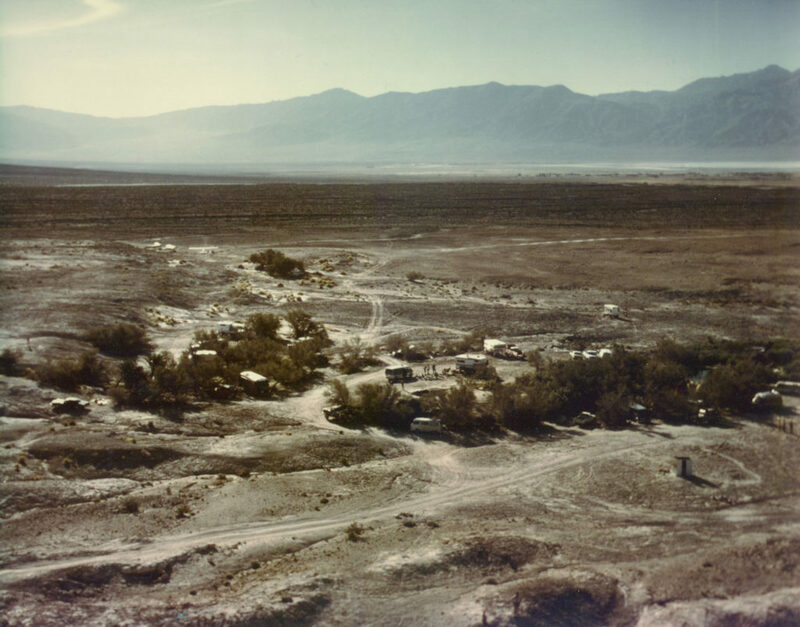 From the county road, the Saline Valley Lower Warm Springs were not as visible as they are today. There was one palm tree in the lower camp, located at the back of camp where a seep fed the tree’s needs, and presently supplies water to the cold pool often referred to as the Dog Pond. Mesquite dominated the camp. There were two ways to the Warm Springs from the county road. The original road was called the Artesian Road and is now closed to through-traffic. It leaves the country road below Hunter Canyon and connected with the present Warm Springs road where the Bat Pole currently stands. Originally there was only a metal post at that junction, standing about four feet high, painted green, and was referred to as “the painted post.” The Artesian Road was a very rough and dusty road that never received any upkeep beyond the vehicle traffic that frequented this choice. If there was rain along the road, it became virtually impassable. The preferred option was the so-called “Painted Rock Road” aka the “Bat Rock Road.” This road was graded periodically by the miners (Mike & Mike) from Willow Creek and could be easily identified by the landmark of the large painted rock at its junction with the county road. 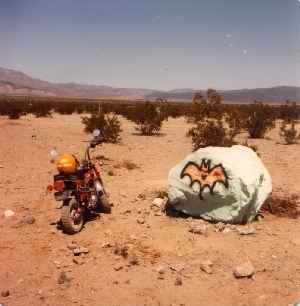 The usual convention was that a bat was painted on the rock. The road crossed Waucoba Wash and could also become impassable because of flash floods through the wash. Turtle Jim recounted a story where on one particular day, a vehicle had gotten stuck in the mud of Waucoba Wash along the Bat Rock Road (the flash flood had been the result of a cloud burst in the mountains and no rain fell anywhere near the road), while a mile away, another vehicle had gotten stuck in the dust along the Artesian Road at the same time. I bounced my way along the Bat Rock road, sitting over the front axle of my VW bus regularly smashing my head into the roof as I continued to learn the value of not being in a hurry on this road to where? Rumor had it there are warm springs up ahead somewhere. Time and perseverance will tell. Sure enough, I eventually pull up to a collection of trees that belie an oasis. Indeed, there is water flowing here, and there appears to be an active camp. I came for a few days and spent two weeks before going to town and returning for another two weeks. 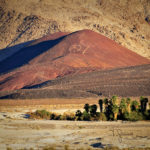 In 1980, and indeed up until 1986, There was little regulation with respect to camping limits in any regard at the Saline Valley Lower Warm Springs. People were free to stay as long as they wished and camp or sleep wherever they wished. What I found was a collection of visitors and residents of various tenures. A variety of vintage trailers and orphaned campers were scattered around the springs randomly. More temporal visitors were often pulled up next to the lawn or arrow weed. I pulled my VW up against the arrow weed immediately below the sunrise pool. There were a multitude of vehicles parallel parked between there and the bathtub. Lucky Rich was the resident care giver at the springs. He lived in a trailer tucked into the arrow weed below the gold fish pond. Oh look!, there’s a gold fish pond at the end of the lawn. Death Valley Golden Trout. Rich was also known as “Banjo Man.” He pretty much knew one song: Boil that cabbage down. He did not know it particularly well but could be convinced to play if he had enough to drink. I have fond memories of hearing him make his way home to camp at the end of his evening. He would take the narrow trail on the side of the gold fish pond. One foot on the trail, the other splashing along in the pond. On occasion, a full body splash, or perhaps landing on his banjo. Rich had a mill site at camp, which he managed to high-grade from Joe Ostringer (https://timenspace.net/2018/04/14/saline-chronicles-the-saga-of-red-braden/). Rich had a copper claim up toward Dry Mountain, but he mainly smelted lead at camp. There was a suspended steel cable leading from the lower lawn down to a small forge in the arrow weed. A small ore cart would take his lead from the lawn down to the forge, where he would make lead ingots for friends and visitors. The source of his lead was a shooting range nearby, where he would collect bullets. Rich was also a pretty good knapper and made arrowheads for people. He fixed a lot of tires (including one of mine) with nothing but hand tools, and never charged anyone for a tire repair. The convention back then was to be thankful and pay it forward. A real curiosity at the Lower Warm Springs was a twenty-three-foot dory on the lower lawn just above the fish pond. This was largely constructed from plywood which had been high-graded from the remains of a hardware store that had caught fire in Lone Pine, and then left on the valley floor by the original lumber miner, to be high-graded once again by Rich and Sam, who decided to build the boat. No longer did they have to wait for their ship to come in. I recall thinking upon first seeing the dory that it was a rather low tide. Next to the dory was a sundial built upon a cairn of rocks that had a metal wheelbarrow wheel set into the cairn. Strange that the dial was often in the shade of mesquite to remind us perhaps that time means but little in the Saline Valley. gathered to swap stories, tell lies, and sing songs. Not a night went by without people gathering to share their smiles, and often busy during the day. In the early days folks often cooked their meals together at the campfire. There was a truck tire rim that was adapted to allow for a grate and a side shelf was welded on for a pot of beans or whatever. A side door in the tire rim allowed for coals to be shoveled in without disturbing the grate. A tree grew next to the firepit which provided some shade in the day. Beer cans could be easily tossed into a box next to the library, much as it is today, without the trash cans or signs. There were no signs at the Lower Warm Springs. People were welcomed and given a tour and advised as to camp etiquette. If some problem arose, it was usually handled in-house, often quietly and with civility. I recall hearing a tale wherein Lucky Rich came along a woman washing her feet in the source, and he sat with her for a while, in time telling her that she was washing up in everyone’s drinking water. He had a very gentle way about him. If more severe transgressions occurred, a person might just be asked to leave camp, or perhaps the valley. And hey, there are chickens running around the Lower Warm Springs. The chickens are great. Just toss your compost on the ground around your camp, and the chickens will be around to clean up the scrap goodies. Additionally, with the introduction of chickens in camp years earlier, a lot of pesky pests were eliminated. A few roosters by the name of Elmer and Pard kept the camp in chickens despite the best efforts of the coyotes. The roosters were something of an issue for some. If anyone lit a cigarette at night, or a car came up the road, those roosters thought it was sunrise and would commence to their crowing. A lot of sleep got interrupted along the way. Aside from the chickens coming around to seeing what they could get, I could always count on Crutch Bill (another resident) to hobble along in the morning and accept a cup of coffee or whatever else might be offered. Bill was a crusty old codger who used to live in Death Valley until it became a national monument and they kicked him out. He did not own a vehicle and would walk in and out of the valley. I was told he really did not need a crutch, but it helped him get rides. He often lived in the box car known to many on the south pass. He was happy to sell you one of his pen and ink sketches for $5 and this helped him maintain a grub stake. I still have my original Crutch Bill sketch to this day. Aside from the food scraps tossed on the ground, people would toss their spent cigarette butts to the ground. This was a pet peeve of Lucky Rich, who did not understand why people did not see butts as trash. Many of us would get up early to scour the camp’s grounds for leftover butts that we could field strip and roll our own cigarettes. (A. I came into the valley without tobacco to attempt to quit smoking; bad idea. B. A long way to the store over hours of poor dirt roads). I recall one night sitting around the campfire, and one of the campers tossed his spent cigarette into the fire. I think three of us butted heads diving in after the prize. the Sunrise Pool. There was a beer can over the pipe which acted as a governor to prevent too much water from going to the pool and subsequently running the source low. The other pipe from the source went to the junction box which directed water to the bathtub, the lower pool, and the sink. There was no lock on the box at the time. The bathtub was the original tub at the springs, and more on that later. It was the one place folks could use soap, and the convention was to use the soap outside the tub and rinse off with the hose that fed water to the tub. I believe at the time there was a shower head at the end of the main pipe as well. The lower pool could be filled either by the main line as we know it today, or a wooden plug could be fitted into that line and water would issue from the pump and there was always a washboard below the pump to help aerate and cool the water. Back in the day, all tub temperatures could be regulated by turning the water up or down by virtue of valves located at the tubs. Drain pipes in all the pools were closed off by tennis balls in socks. Overflow from the pools or drains for the pools exited to simple ditches which either skirted the edge of the common area, or in the case of the lower pool, through the middle of the lawn. All the water found its way to the fish pond. Simplicity. The lawn was watered by means of a simple passive sprinkler on the end of a hose that ran down from a bib at the sink and needed to be moved around regularly. The lawn was not quite so large at the time, and the pond was larger. Cell phones had yet to be invented. When you were “in” you were away from the world. Most communication with the outside world took place through CB radio. Lucky Rich had connections with a few folks in Big Pine and Lone Pine who monitored the radio. Folks living in the valley all spoke with one another on the Ch. 13 party line. Camp at the Lower Warm Springs was physically far more open back in the day. No walls, no fences, no gates. In later years, when I moved to the valley, Chili Bob and I would sit at the campfire at night (after having delivered all the inebriated friends back to their camps) and see headlights appearing on the south pass. We would watch the lights descend the fan and could mark their progress as they crossed the valley floor. Would they take the Artesian Road or the Painted Rock Road? As they approached camp, we were always hopeful it would be that long-promised bus full of girls. More often than not, the car would drive by and continue to Palm Springs. At this point, we would see another pair of headlights on the south pass, and would eagerly await their arrival, often to watch them once again pass us by. I hope to add to these descriptions as things come to mind, and I would love to hear of the memories of others who knew the Lower Warm Springs in the early days. Please leave some memories in the comment area below this blog, and I will make sure they are incorporated into the project. Coming up next: How the pools came to be. I’ve hung around Saline Valley for 20 years but inexplicably never spent much time at the springs. Now I see what I ‘ve missed. Thank you for the article. In 1974, when David turned 2, we had a birthday party for him. Around 150 people showed up. Jackass Andy and I supplied the two year old wether goat for the pit roast. Everyone brought something to eat, salads vegetables, beans, macaroni, cold cuts…you name it. The goat roasted for about 6 to 8 hours on mesquite coals, wrapped in burlap sacks drenched in beer. One group of people brought a “mystery meat”, about 25 pounds worth. (It was wild duck breast.) A wonderful time was had by all. I was there as a kid from the late 70s to the early 80s. I remember Rich, Johnny Tequila, Vernor, Killer Kane, Johann, … pilots, miners, hippies, scientists, native Americans, blm guys, … lotta music, very free. Another treasure rescued from potential oblivion. Bless you for sharing these treasures with us Tom. Sam is opening her archives even as I write. Kudos to those that put together the “Beach Party” in the dunes about,….uh…1995? And those that brought in the surf boards, beach boys, skii’s, grass skirts, and the rest!